I perform at about 70 weddings a year, so I’m pretty experienced at this sort of thing. And over the years, I’ve learned a thing or two about booking wedding entertainers. Ask how many weddings they’ve worked at and if they’ve got any evidence. I’ve got photos and videos from over 200 weddings I’ve performed at over the past few years. If a magician can’t provide that, consider why that may be. You want to feel confident they are who they say they are before parting with your money. By meeting the magician, you’ll get a feel for their personality. It’s important that a magician is amiable and able to interact with your guests. There are many differing styles of magic and not all may suit your audience. Once you’ve met them, start your research! What’s their online feedback like? Does it look like it’s genuine? Lots of anonymous quotes from friends does not mean they are good entertainers. I have over 250 five star reviews, and around 130 from brides and grooms who’ve voted for me in The Wedding Industry Awards. Make sure you Google the performer. If Google hasn’t heard of them, there’s probably a good reason why. If they state they are award-winning, ask them about the awards and if they have proof – or see if you can find proof. I’ve not personally seen a magician’s website that isn’t award-winning but few have details of what the award is. The same applies to the word international. Performing a trick for the barman on holiday does not make them an international magician! Ask if they’re a member of The Magic Circle. It’s not the end of the world if they’re not, there are lots of amazing magicians who choose not to be, but it’s another layer of comfort about the act your booking. Ensure you confirm that they have full Public Liability insurance. If they haven’t – avoid! God forbid they have an accident on your wedding day and they don’t have insurance. Make sure you get a contract that secures you both, and an invoice too. Most insurance companies require this now in any case. Finally – don’t always go for the cheapest option. There may be a reason why they’re cheap. Have you ever bought Ryanair seats only to complain about the experience from the moment you arrive at the airport? Don’t have a Ryanair experience on the most important day of your life. You deserve the best, as do your guests. 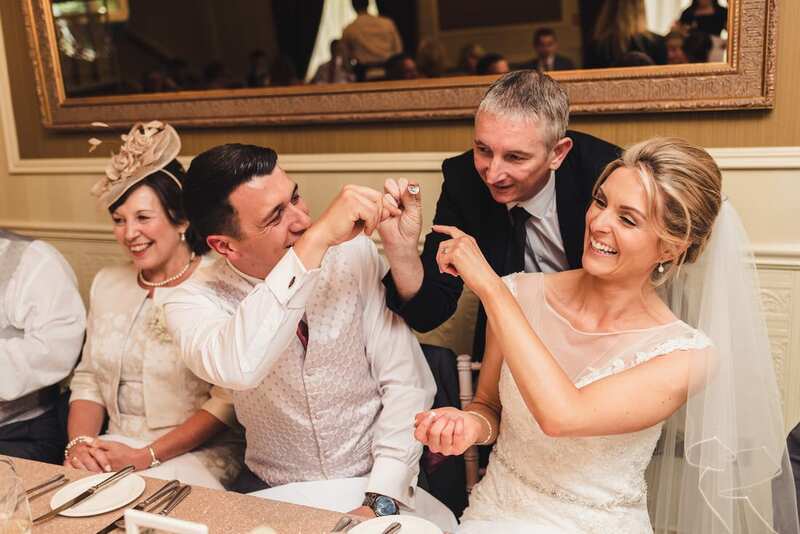 A magician is perfect for a wedding as they can look after your guests when there’s a lull in proceedings. Whether it’s ice breaking magic during the photographer’s session or when you’re having your all-important couple photos. A magician can mix and mingle between two families and create fun, laughs and add to a great experience. Table magic can also take place during the wedding breakfast. It’s difficult to sort a seating plan that keeps everyone happy, so a magician will provide an excellent opportunity for people who have not met, to engage with each other at the table. The lull between the breakfast and evening is also popular, as guests have nothing to do other than wait for the evening reception to start. Equally the evening reception is popular as the evening guests get to be involved which helps them settle in once they arrive. Thanks for your excellent advice, Owen. If you’re looking for a magician for your big day and you’re near the Midlands, you should look him up. His website is owenstrickland.co.uk and you can also find him on Facebook and Instagram.